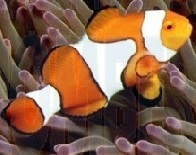 Genting is a kampong on the southwest side of Tioman. It is a relatively large village between the village of Paya and the village of Nipah. 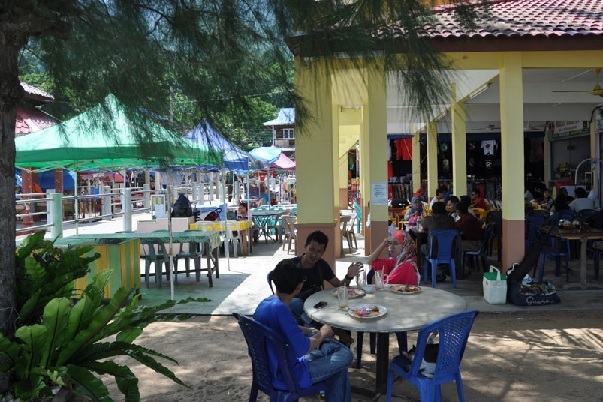 This Genting kampong lies at a 1.5 km stretch of beach, with the green hills of the tropical rainforest as background. The green of tranquillity and this peaceful village is popular with many of the tourists. The village is quite isolated and the next kampong "Nipah" is poorly accessible on foot or by bike. In the Malay language a genting is "a mountain pass". The majority of the resorts in Genting are of the budget-class range and are mainly along the slopes overlooking the green, relaxing tropical jungle and the blue, turquoise South China Sea. 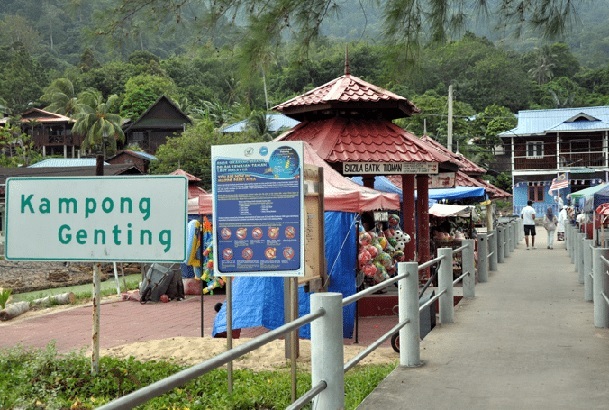 Genting is the third largest village in Tioman, after Tekek and Juara. The ferries from Mersing will make a first quick stop in Genting, before continuing to the villages of Paya, Tekek, Air Batang and finally Salang. You can book the tickets online by clicking on the banner below. There are three services per day in both directions. It is a favorite place for people from the mainland and tourists from Singapore. Genting has an extensive collection of restaurants that are located along the beach. In the weekends there is usually more action, then there are more tourists and you hear the karaoke music in the evening. Generally spoken the beach of Genting is fantastically beautiful with long bays with sandy water and clear water. The beach is a narrow strip of golden sand, bordered by dark gray granite boulders and covered with lush rainforest at the foot of steep hills. The village stretches along a concrete footpath, which follows the coastline and the buildings reach barely a hundred meters from the coast in the jungle beyond. In Genting are a few shops, restaurants, cafes, chalets, a clinic and a mosque. This forms the core of the village, which lies around the jetty. The wooden houses of the villagers are a few meters further along the footpath in both directions, surrounded by the high emerald green trees of the jungle. You can easily go from one end of the village to the other in about thirty minutes, or you can rent a bike to explore the kampong. This concrete footpath is a main path in Genting. It goes further north to the village of Paya. Along the way there are footbridges over the many mountain streams that flow into the ocean here. It will not be long before you encounter monkeys or lizards. The only thing you will hear on this trip is the call of birds and the monkeys.